A SEPTA Broad Street line train leaves City Hall station. SEPTA pitched three proposals on Thursday to extend the Broad Street Line to the Navy Yard, but the long-percolating project faces a hefty price tag and a hard road to win funding. The price tag for the cheapest of the options is $869 million, and the other two are $1.5 billion and $1.6 billion. Under current ridership projections, the project wouldn’t qualify for needed federal funding. Also, it is possible better transit around the development could be achieved with buses at much less cost. SEPTA is exploring three possible routes a Broad Street Line extension might take into the Navy Yard. 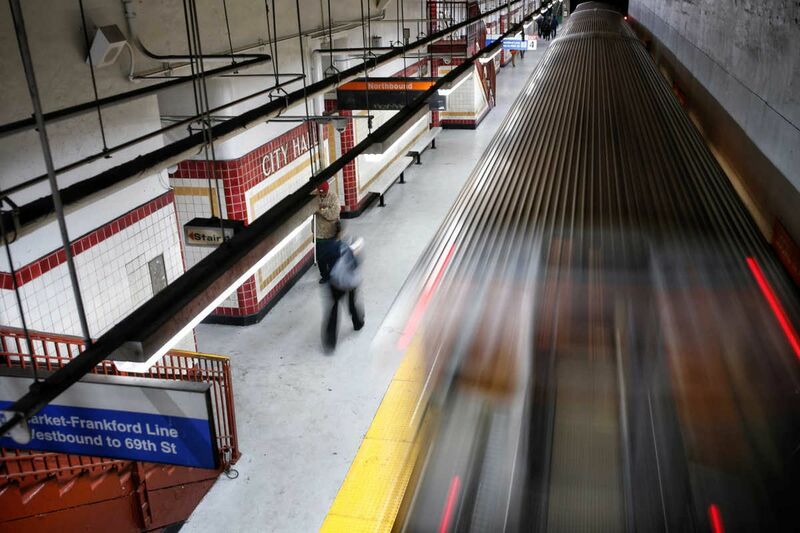 A Broad Street Line extension has been on Philadelphia’s wish list for years. A 2014 report on transportation access to the site predicted that engineering could begin this year. The expected price tag was much smaller — up to $400 million — at a news conference in 2015 in which Mayor Jim Kenney, U.S. Sen. Pat Toomey, and recently indicted union boss John J. Dougherty all threw their weight behind an extension. At that time, construction was predicted to begin by the end of this decade. The project has not progressed much since then. The Broad Street Line’s southern terminus is NRG Station, near Philadelphia’s sports complex, about a mile and a half shy of the Navy Yard, which is home to 160 employers and 13,000 workers, and is still growing. The 1,200-acre site is projected to eventually sustain 13.5 million square feet of development and 30,000 people. The cheapest of SEPTA’s three extension options would run the subway line along Rouse Boulevard. The other two options would provide service deeper into the campus. All three would rely on enhanced bus service to connect riders with the rest of the campus. More details are expected by the end of February. Creating a subway extension — the city’s first tunneling since the 1970s — would be an enormous undertaking likely to occupy three to five years. The Rouse Boulevard plan, which proposes one new station on the Broad Street Line and is SEPTA’s preference, would be a little more than a mile long. The two other alternatives, which each would add two stops to the line, would be just shy of two miles long. SEPTA would have to invest in a tunnel boring machine, a massive piece of equipment that would be inserted through a pit near NRG Station and would burrow close to seven feet below sea level. It would go beneath I-95, Broad Street, and a freight rail line used by CSX, and would link to unused tracks directly beneath the active NRG Station platform, said Devin Plantamura, a track design engineer with the contractor HTNB. Stations, meanwhile, would be carved out with digging from the surface. A 2014 survey found that 44 percent of the workers at the Navy Yard drive to their jobs, and at the open house some said a better public transit option would be welcome. Ridership projections for the subway extension, which SEPTA did not have available Thursday, aren’t high enough to meet the standards for federal funding. Grants take into consideration whether there is a residential development near a project, and the Navy Yard has none. Typically, federal funding will cover half the costs of a major infrastructure project like the extension. The rest of the money would likely come from state and local contributions, said Chris Puchalsky of the city’s Office of Transportation, Infrastructure, and Sustainability. A change in commuting habits and more development at the site, including residential units PIDC says are coming, could boost ridership projections to meet federal requirements.